Beach house style is not just for the summer time! Beach house style can be adapted to ensure a beautiful warm feel in the winter as well as a cool comfort in summer. Work with subtle colour changes and natural textures to create a warm feeling in the cooler months. The style presents a relaxed, effortless, casual and natural feel characterised by whites, blue and beige hues. Whitewash and recycled timber furniture mixed with natural, simple furnishings and a mix of stripes and nautical accessories have etched a place in the hearts of those who love beach house style. Here are 5 beach house decorating ideas you can use to create the feeling of a beach style paradise all year round. Stick to a neutral, muted palette of off-white, pale grey and taupe for a sophisticated take on the beach style. Also considering incorporating shades of blue such as aqua or duck egg with accessories to add interest into your space. Never underestimate the impact of sunshine in a room. Louvers and ventilation blinds are a great option for letting light in without sacrificing privacy. Skylights are also a great way to bring more natural light into dark rooms in the centre of the house. 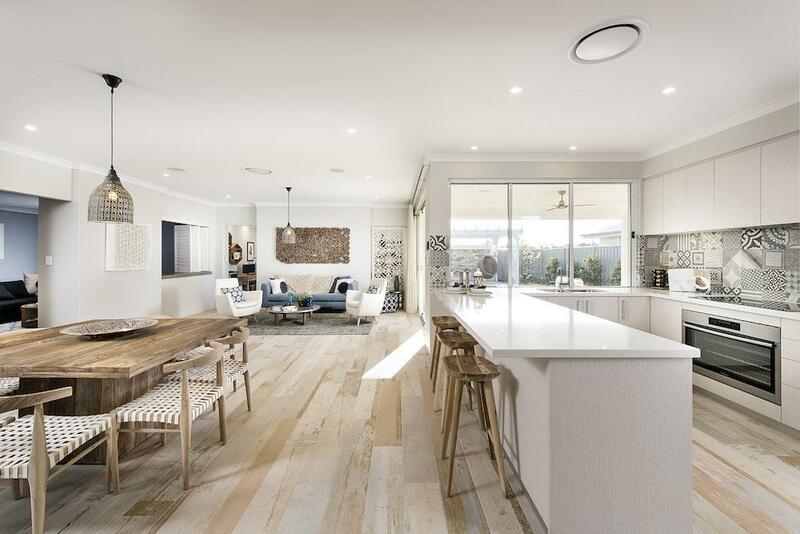 Timber is a key feature in a beach style home, especially lighter timber. Avoid dark timber as this can come across heavy and instead choose a bleached, distressed or whitewashed timber. You can incorporate this in furniture, flooring, cabinetry or accessories such as photo frames or table bowls. With its use of a light colour palette including off white and pale grey it ‘s easy for a beach style interior to appear bland. For that reason, incorporate a range of textures including driftwood furniture, rattan of even a few medium sized tropical plants. Instead of a throw blanket, l a striped Turkish towel over your lounge and feel your homes energy become a little more ‘beachy’. An easy way to create an authentic beachy feel in your home is by adding a few shells, driftwood or coral that you’ve collect in jars or bowls throughout your home. Not only will they give life to your home, they will bring a natural warmth and texture to your decorating style. Bring colour to your outdoor living area by adding vibrant hues in striped and chevron prints to give a coastal, summery feel. You can do this through cushions or painting old pieces of outdoor furniture in bright colours.